I'm glad I got out last night and went to the minor league baseball game with some friends. It was a pretty bad day, but by the end of it I think I was in a much better place both emotionally and spiritually. The anger and pity are slowly being replaced by willingness to submit to God and just sadness. It's okay to be sad, I know, but I also know there is hope for the future because God has amazing plans for me and he has told me so in his word (RELATED: When Things Aren't So Easy). I had to get up for practice this morning-- which was kind of a bummer since I just watched everyone do warmups and stuff-- so I'm pretty sleepy now. But I am getting in the rhythm of things at college. I still wish so badly that I could just be at home. It stinks when I have a day like yesterday and I have no dad, mom, best friend, or family to just hug me. 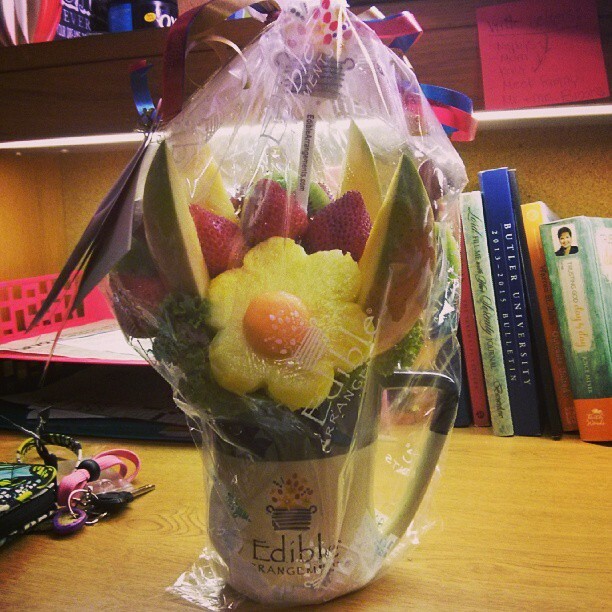 But my mom did send me an edible arrangement, which made my day. Sometimes, fruit has that healing power, haha. In the moment that I got the package though, I felt so special. I'd spent all day just trying to not lash out at God, because I felt like he'd abandoned me too. But I know now that God is in the midst of all that, and receiving a gift reminded me that I am never forgotten. "If you then, who are evil know how to give good gifts, how much more will your heavenly father give good things to those who ask him (Matthew 7:11). I'm silly to assume this isn't good because I can't see out of my own present bubble. But God sees the eternal, and he's whispering: "Hold on, just a little longer! It's going to be great! I'm going to reveal more of myself to you and you will have a harvest!" For the next week, I can't do much of anything. No running, biking, or swimming. So I'll have to find productive ways to use my time instead. But that means I'll get to spend more time writing and praying to God, which is a definite silver lining. "Be of good cheer, for I have overcome the world." Christ says. And I offer the same word to you. No matter what you are going through today, lean on God and look to the eternal. This is all little and insignificant in the light of God's glory forever-- I think that's pretty sweet! Have a great Labor Day Weekend!